This is the last flamingo card that my friend requested. I used the color combo from Color Throwdown 288 and the sketch from Just Add Ink 211. I started out by stamping a bunch of flamingos, masking some off. I originally wanted to use the sentiment "thanks a bunch", but as I looked through my stash I didn't have anything that said that....I really thought in my head that I did! I settled on the "thanks much" from Six Sided Sampler. I'm pleased with the outcome, although I think "thanks a bunch" would have been much cuter! Here is a sneak peak of my project for this month's Paper Crafters Sampler. Gardens are coming to life. Budding trees and perennials will soon fill our homes with burst of color and fragrance. If your garden hasn’t awaken quite yet, try decorating with a few paper beauties. 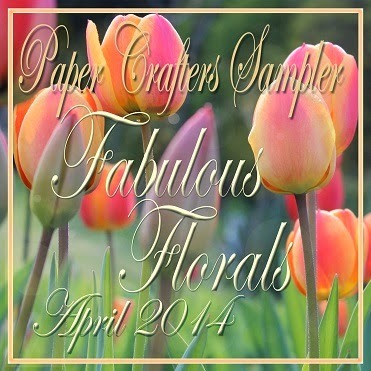 The April issue of the Paper Crafter Sampler, “Fabulous Floral”, issue shares an array of ideas for beautifying your home with flowers until your outdoor garden is in full bloom. All projects in this issue are focused around a floral theme. You’ll find cheery and feminine crepe paper poppies, pop-up flower box cards and several lovely cards with flowers popping off the front. This month’s template is a “Strawberry Pot”. A little table top container for stuffing with faux strawberries or flowers. Here is flamingo card #2 for the request that my friend made. I used the color combo from Just Add Ink 208.....well, kinda. Now that I look at the combo as I post this, I see it's Smokey Slate and not Sahara Sand. I had it in my head that it was Sahara Sand.....Oh well! Anyway, I used the same flamingo stamp that I purchased from Ebay only I used my black marker to color it all in and make it a silhouette. I used my brayer to make the water/sky background, then sponged in the Sahara Sand. The foliage silhouettes are from Inspired by Nature and a single stamp I bought at Hobby Lobby. It's hard to see in the photo, but I stamped some words and splotches on the sand colored DSP as well as sponged it. For the base card, I stamped the big image from Postage Due in Pacific Point ink. I added a little "Miss You" tag from the Just Saying set.